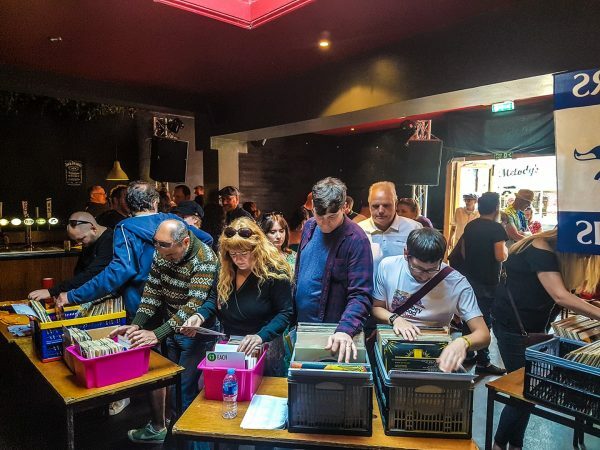 No More Durty Water would like to say a huge thank you to all who attended the record sale on 19th May and made it such a successful event, more so than we could have imagined. It was amazing to see so many people part with their hard earned cash, ensuring that Paul’s legacy will live on in Portsmouth and beyond, with his music rocking DJ sets and enjoyed in many good homes for years to come. Firstly our heartfelt gratitude to the Keeler family for donating the collection, which generated so much interest as Paul simply had great taste in tunes. Thanks and praise to Billy Steere, Mark James and Gary Samways for their help in pricing and cataloguing the collection, not an easy task with many obscure rarities to research. Big shout out to Jonty Walker for organising the event and helping out arranging records, as did Jim Barber. Props to all the above for their help on the day along with sterling support from Charlie Waddington and Luke Storkey, who also both contributed the graphics. In particular, No More Durty Water is grateful to the ever reliable Geoff from the Wedgewood Rooms for donating the free use of the venue, and for his kind help on the day. Big love and thanks also go to Michele Roux for living with the collection in her home for many months while the plan came together! Finally, thanks again to you- Paul’s friends, local DJs and the vinyl loving public for supporting our charity. Paul would have been proud to see how much his music was loved by people buying it. So after all the hard work we are delighted to announce that the fantastic amount of £3,261 was raised on the day for No More Durty Water. Engineers have already been instructed to survey more sites for much needed Protected Springs to be built in Uganda, to convert the proceeds into clean water in the coming months. Click here for our Projects section showing what we have achieved to date. There will still be an opportunity to purchase some of the remaining collection so keep an eye out on the website for details. You can also sign up here to be contacted regarding future events. Keep it vinyl and keep it durty, we look forward to seeing you at our next event.